The Raise the Wage Act of 2019, which proposes raising the federal minimum wage in six steps to $15 per hour by 2024, will result in a pay increase for 38.1 percent of all black workers and 23.2 percent of all white workers. 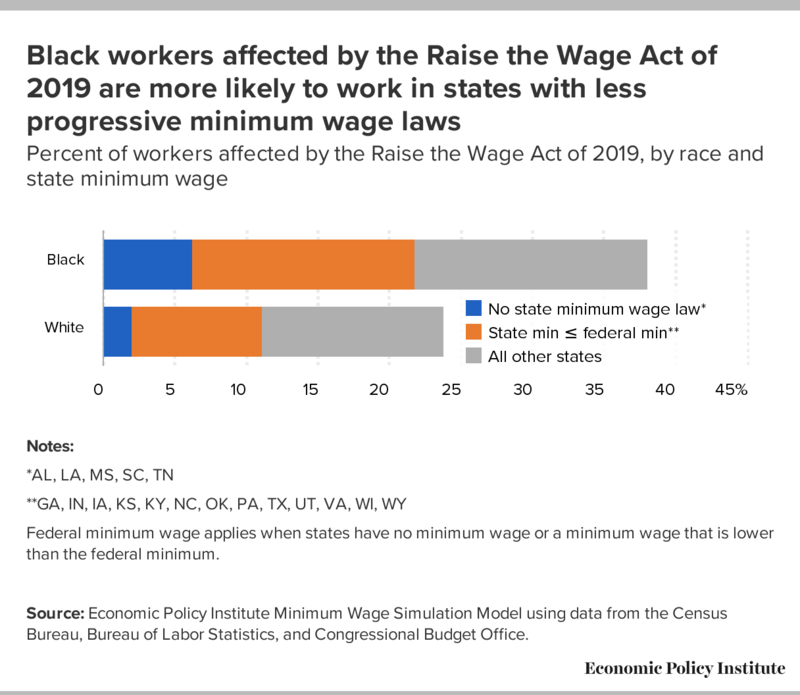 As the chart below shows, 21.8 percent of all black workers and 11.1 percent of all white workers will be affected by the Raise the Wage Act because they work in states where the minimum wage is set by the federal minimum. This includes a subset of states with no minimum wage law or where the state minimum is below the federal minimum. The share of black workers affected by the bill because they work in a state with no minimum wage law is three times higher than the share of whites. Federal minimum wage applies when states have no minimum wage or a minimum wage that is lower than the federal minimum. Source: Economic Policy Institute Minimum Wage Simulation Model using data from the Census Bureau, Bureau of Labor Statistics, and Congressional Budget Office. State differences in minimum wage laws function in a way that is similar to the effect of early sectoral exclusions in the Fair Labor Standards Act (FLSA) of 1938. These exclusions were later eliminated by amendments to the FLSA that extended the minimum wage to those working in agriculture, nursing homes, laundries, hotels, restaurants, public schools, and hospitals in February of 1967. According to a 2018 working paper by Derenoncourt and Montialoux, those newly covered sectors employed nearly a third of all black workers and about 18 percent of all white workers in the United States at the time. As a result, they estimate that this 1967 extension of the minimum wage had a significant effect on raising the wages of African American workers, accounting for 20 percent of the decline in the black-white earnings gap between 1967 and 1980. There are important parallels between the sectoral exclusions of the original FLSA of 1938 and the current “state exclusions” to progressive minimum wage policy. Just as black workers were significantly overrepresented in the industrial sectors originally excluded from minimum wage coverage, black workers today are significantly overrepresented in states that have not raised their minimum wages as the purchasing power of the federal minimum has eroded. In both instances, these were intentional policy decisions rooted–at least in part–in indifference if not outright hostility toward black workers. In the 1960s, it took the large sectoral expansions of the 1966 FLSA amendments to allow more black workers to benefit from the federal minimum wage. Today, it will take a significant increase in the federal minimum wage to achieve a similar goal.